The arcade cabinet is shaped like a house with shingles. 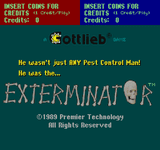 The game play is about swatting various bugs, frogs, rats and spiders. Your character to do this is a floating hand or fist where you swat or smash the pests. Clear the room to get to others in the house.